This time of year really forces us to use some ingenuity when it comes to cooking with our own seasonal ingredients. All we have left in the gardens at the moment are Beetroot, Swiss Chard and Leeks. With the addition of a few store cupboard extras, here’s a tasty vegetarian menu that we recently came up with. Chop up the green tops of about 10 baby leeks (keep the white part to roast, below) and the leaves of 10 stalks of chard (keep the stalks for a gratin, below). Cover with 1 litre of vegetable stock and simmer for 15 mins. Season well and blend. Tasty and uber-healthy. Chop the chard stalks into 5 cm lengths and fry gently with 2 cloves of garlic and some thyme leaves for about 10 mins. until tender. Stir in 100ml of creme fraiche and top with a mixture of 30g. breadcrumbs and 30g Parmesan cheese. Pop under a hot grill until browned. 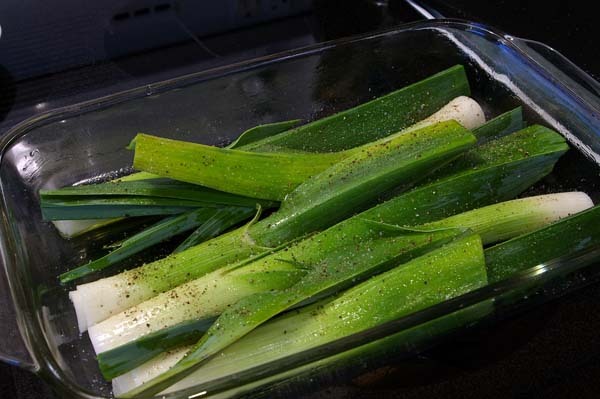 Toss the baby leeks in a little olive oil and season. Cover with foil and roast at 160 degrees for about 20 mins, until tender. Drizzle over some hummus, romesco sauce or basil oil. Simmer 250g of Puy lentils in light vegetable stock for about 25 mins. until tender. Season well, drizzle over some olive oil and 2 tbsp balsamic vinegar and some sliced roast beetroot and goats’ cheese or cubed feta. This entry was posted on Sunday, February 17th, 2013 at 5:31 pm	and is filed under Recipes. You can follow any responses to this entry through the RSS 2.0 feed. Both comments and pings are currently closed.